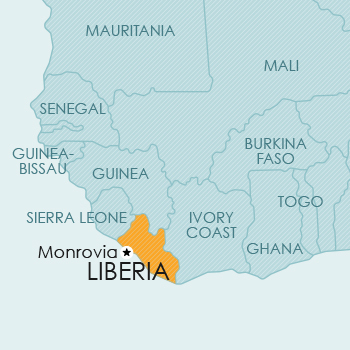 Liberia is located on the west coast of Africa, bordered to the north by Sierra Leone and Guinea, to the east by the Ivory Coast and to the west and south by the Atlantic Ocean. Although the Industrial Property Act of Liberia was published in 2003 it has not yet been passed by Parliament. However, in practice, with effect from 1 January 2009, its provisions have been complied with by the Trade Marks Office under an executive decision. Liberia is a member of the Paris Convention, the Madrid Agreement and Protocol, and the ARIPO (Banjul Protocol). Provision is made for the registration of trade marks for goods and services, for collective marks, and for the protection of trade names. Although the Industrial Property Act of Liberia was published in 2003 it has not yet been passed by Parliament. However, in practice, with effect from 1 January 2009, its provisions have been complied with by the patent office under an executive decision. Liberia is a member of the Paris Convention, ARIPO (Harare Protocol) and PCT. Patent protection is available via a national filing or an ARIPO application designating Liberia. The 2003 Act (which, as indicated above, is being applied), incorporates the Harare Protocol (which regulates patent and design filings in ARIPO) into Liberia’s national law. However, the validity of an ARIPO application designating Liberia is uncertain as it is not clear whether the 2003 Act is legally in effect. The 2003 Act also provides for PCT filings. Accordingly, patent protection may be obtained via the PCT, but again there is some uncertainty in regard to validity. Although the Industrial Property Act of Liberia was published in 2003 it has not yet been passed by Parliament. However, in practice, with effect from 1 January 2009, its provisions have been complied with by the Designs Office under an executive decision. Liberia is a member of the Paris Convention and ARIPO (Harare Protocol). Design protection is available by a national filing or via an ARIPO application designating Liberia. Liberia has implemented the Harare Protocol (which regulates patent and design filings in ARIPO) in its national laws, thereby giving design protection to applicants seeking to obtain a design registration via ARIPO. Liberia is a member of the Berne Convention, the Rome Convention, the Phonograms Convention, and the Universal Copyright Convention. mere data regardless of the form in which it is described, explained, illustrated. Currently, no legislative provision for plant breeders’ rights or other sui generis protection for plants is available in Liberia.